Hi there, I’m Daniëlle. Thanks for visiting my blog. I was born in the very tropical and fertile land of Surinam and raised on the lovely Island of Curacao. 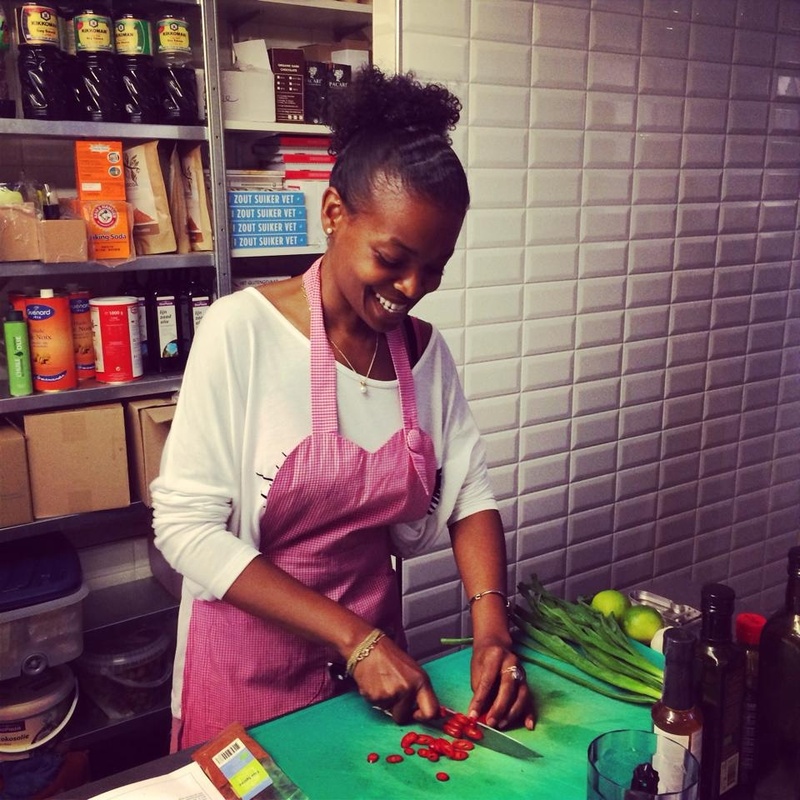 Currently I live and work in Amsterdam as a holistic food & lifestyle coach and wellness chef specialised in Ayurveda. I coach people to a healthier lifestyle, teach cooking classes and will be starting the first online Ayurvedic Food and lifestyle boutique soon. You can find more information about my activities on my website www.thesoulfoodcompany.com. Making the wisdom of one of the oldest holistic systems around available to a modern audience in a practical and fun way has become my life’s mission. This ancient science came into my own life after years of weight struggle during which I lost and gained around 20 kilo’s three times in row! I finally had enough of feeling unwelcome in my own body, following useless unhealthy diets and trying to fit into a box I clearly did not fit in. So I turned my gaze elsewhere and started studying alternative holistic lifestyles. It always strikes me as odd when we refer to these integrated systems as “alternative” when what they really are is just natural. And so discovering Ayurveda felt like coming home to me. It made complete sense that we as humans, like everything else on earth, are made up of our own unique mix of the 5 elements in nature and by acknowledging that and working with (our) nature instead of against it we can obtain our maximum level of wellbeing and health. So I adjusted my eating habits and lifestyle and haven’t looked back since. But the thing that most got me hooked on Ayurveda was the concept of Rasa. Loosely translated from sanskrit rasa means juice, sweetness, joy and even love. Every bite we take, every relationship we invest in and every endeavor we set out to do in our lives are supposed to increase our level of rasa. Being a foodie at heart changing my eating habits was only possible if the foods I was gonna be eating were to be extremely tasty, attractive to look at, practical to cook ánd make me feel like a million bucks to boot. And so my kitchen experiments to create delicious modern meals that were in keeping with the ayurvedic tradition began and haven’t stopped since. On this blog I share my experiments with you (well at least the ones that worked out!) in the hope that they will increase your rasa as they have mine one happy bite after another! What a fantastic initiative! Love you’re style and look forward to all the delicious recipes. Thanks Eef! Hope you are well. Let`s catch up soon. Thanks so much! Hope you visit often. I LOVE your blog, and your photographs. I recognise a lot of your story. I’d LOVE to meet you sometime as I live in Amsterdam too! Ik spreek ook nederlands want ik woon hier al 20 jaar inmiddels. I am about to complete my Ayurvedic Nutrition certificate I took at the AAS. Thanks for your great cooking the last few days at the yoga-retreat. It was delicious! I love your blog and hope we meet again. Thanks again for your tips. Love this insprational opening about yourself and the mission behind it. Thanks Gio! Really sweet of you. Have a great sunday.